National security adviser John Bolton speaks at a Federalist Society luncheon at the Mayflower Hotel on Sept. 10, 2018, in Washington, D.C.
12 Sep 2018 – The United States has never been a friend of the International Criminal Court. While relations between the U.S. and the ICC have fluctuated over the course of different administrations, the American government has steadfastly refused to take the step that 124 other states have of ratifying the Rome Statute and thus becoming a member of the international legal body. The ICC’s mandate to investigate war crimes has thus been hampered by the unwillingness of the world’s sole superpower to commit to the organization. 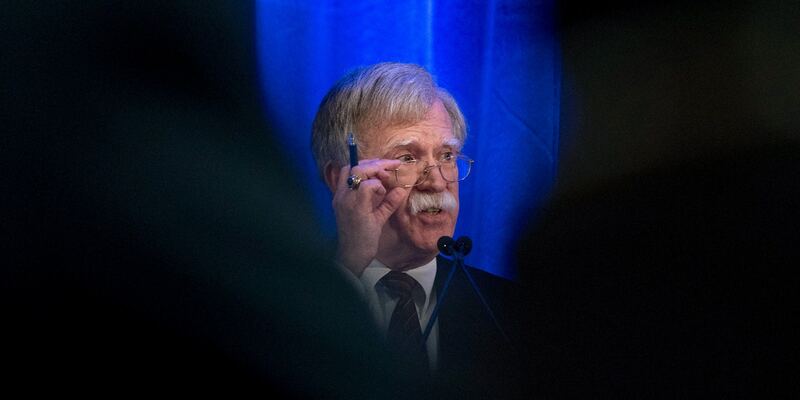 In addition to this death wish against the court, Bolton said that the United States would retaliate against any ICC investigations into U.S. activities by sanctioning the travel and finances of ICC officials, even threatening to prosecute them in American courts. The crimes in question appear to have been related to detention programs run in Afghanistan during the early years of the U.S. occupation. While the report does not name the individuals responsible nor their victims, it indicates that there are dozens of cases in which torture, cruel treatment, and sexual assault were committed by American soldiers and CIA officers in Afghanistan from 2003 to 2004. Given longstanding U.S. refusals to cooperate with ICC investigations, it’s unlikely that the 2016 document — a preliminary report from the prosecutor’s office — would have succeeded in bringing U.S. officials to trial at the Hague. Bolton’s campaign thus seems intended on solidifying the fact that the United States is free of international norms on human rights conduct, with those who even investigate its actions subject to threat. That the ICC investigation reaches back to the George W. Bush era, when Bolton served as United Nations ambassador, is fitting. In the years after the U.S. invasions of Afghanistan and Iraq, the United States began to come under withering scrutiny for its detention policies in those countries. In addition to high-profile cases of torture at prison sites like Abu Ghraib, the CIA and U.S. military have been accused of brutalizing and even murdering prisoners held in their custody at detention facilities like Bagram Airbase in Afghanistan. To date, Passaro, a civilian, is the only person to have been held legally accountable for torture and murder carried out under the CIA detention program. Civilian contractors working for the CIA have also engaged in the murder of Afghan detainees, including David Passaro, who beat to death an Afghan man named Abdul Wali who had turned himself in to authorities after being accused of involvement in a militant attack. Passaro was later sentenced to eight and a half years in jail by an American court. Following his release, he briefly returned to the public eye in media interviews justifying his involvement in the murder. To date, Passaro, a civilian, is the only person to have been held legally accountable for torture and murder carried out under the CIA detention program, in Afghanistan or elsewhere. This despite a landmark 2014 Senate Intelligence Committee that documented, in excruciating detail, widespread evidence of torture and other abuses carried out by CIA officials. The unwillingness or inability of U.S. courts to seriously investigate war crimes carried out by American citizens is part of why the ICC mandate in Afghanistan has been viewed as an important effort to bring a minimum level of accountability over the conflict. This past November, the court announced that it planned to move forward with investigations stemming from its 2016 report. Given its longstanding intransigence toward the ICC, it was unlikely that the United States would ever have cooperated with its investigation into war crimes in Afghanistan, even under a less bellicose administration. But the Trump administration’s threats to target specific ICC officials over their war crimes investigations enters a new realm of hostility against international law. The consequences could be a further degradation of already shaky international norms surrounding human rights in conflict zones.